The Morrison-Yamhill MAX Improvements will rejuvenate track in one of the oldest sections of the MAX system. But pedestrians, bicyclists and auto drivers will benefit, too, as the project will improve the surface of a busy one-block stretch on SW 11th Avenue in downtown Portland. 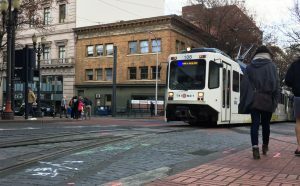 Before that long-term gain, travelers will need to make some temporary adjustments beginning April 30 as the construction will lead to MAX and Portland Streetcar service disruptions as well as road and sidewalk closures. Also, MAX riders may want to think twice before buying a month pass for May as the improvement project will impact service on all lines from Sunday, April 30 through Saturday, May 20. We thank riders and the public for their patience and their understanding as we work to make these important improvements. 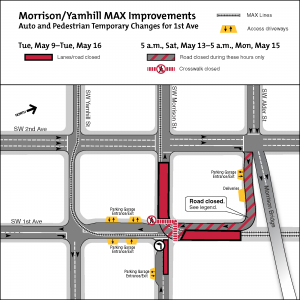 During the Morrison-Yamhill MAX Improvements project, TriMet will upgrade the track on SW Morrison and Yamhill streets at 11th Avenue, removing wooden ties and replacing special track work as well as installing new switch machines and cables for the signal system. This will help keep the MAX system moving and create a smoother ride on board both trains and streetcars. It also will benefit pedestrians, bicyclists and drivers as potholes and broken bricks will be repaired. This area is heavily used by MAX trains, streetcars, autos, cyclists and pedestrians. 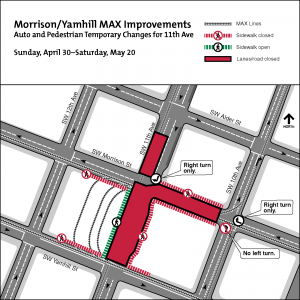 Further east, crews will be replacing curved rails on Morrison and Yamhill that connect to 1st Avenue. MAX Blue, Green and Red lines will be disrupted and all MAX lines will have reduced service from Sunday, April 30 through Saturday, May 20. Space on board trains will be very limited, riders should consider altering trips to avoid main commuting hours, using TriMet regular bus service, carpooling, biking, walking, working from home or using other transportation options. Those who buy monthly passes may want to consider getting a book of tickets for May instead. May passes go on sale April 20. Riders can get line-by-line details, view animated maps of the service changes and check the special schedules that will be in effect during the project at trimet.org/morrisonyamhill. All Portland Streetcar lines will be disrupted for the first two weeks of the project, from Sunday, April 30 through Saturday, May 13. Riders can get service information at portlandstreetcar.org/service-interruption-april-30-may-13. The construction will close some streets, sidewalks and crosswalks in downtown Portland. Also shuttle buses will be running on several streets, to provide alternate service for MAX and Portland Streetcar. The majority of the sidewalks and crosswalks within the project area will be closed or restricted to local access only. Crosswalks will be closed within the project area but adjacent sidewalks will remain open. From 5 a.m. Saturday, May 13 through 5 a.m. Monday, May 15 there will be additional street closures. 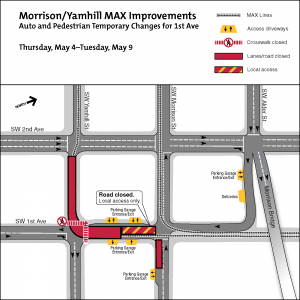 Pedestrian access is maintained through the project area however, during the weekend of May 13-15 only local access will be allowed on SW 1st Avenue between Alder and Morrison streets. Shuttle buses will provide alternate service due to the disruption to MAX Blue, Green and Red lines, with buses running about every five minutes or less between Providence Park and Rose Quarter areas. These buses will be using the regular travel lanes on SW Taylor and Salmon streets between 17th and 5th avenues as emergency sewer repairs will impact Morrison and Yamhill streets. The MAX shuttle buses will cross the Steel Bridge, adding to the traffic volume on NW Glisan and Everett streets as well as N Interstate Avenue and Multnomah Street in the Rose Quarter area. Drivers and pedestrians also will encounter some lane closures and changes on SW Market at 10th and 11th avenues, as Portland Streetcars will turn back south in this area and shuttle buses will pick up and drop off riders. The Streetcar shuttles will run mainly on 10th and 11th avenues. With the MAX service adjustments and traffic impacts in downtown Portland, consider taking part in the Bike Commute Challenge in May, hosted by the Street Trust (formerly Bicycle Transportation Alliance). Also, BIKETOWN, Portland’s bike-share program, is offering a free ride during the Morrison-Yamhill MAX Improvements project. Use the code TRIMET17 to receive one Single Ride pass, good for a 30-minute trip. Redeem the free ride at biketownpdx.com or using their app. TriMet continues to reinvest in the MAX system, tackling more projects in 2017 to improve our service so riders can better rely on us to get them where they need to go. While MAX on-time performance — our measure of reliability — is improving, there’s more work to be done to keep trains moving. As part of TriMet’s agency-wide efforts to make our transit service better, we are completing a number of upgrades and projects necessary for any light rail system. TriMet coordinated with Multnomah County, Portland Bureau of Environmental Service and Portland Parks and Recreation to align sewer and other infrastructure repairs so they will happen during our Morrison-Yamhill MAX Improvements project. This avoids additional disruptions to MAX service in downtown and is just one example of how local agencies are working together to lessen the impact during what will be a very busy construction season. Learn more at movePDX.net.